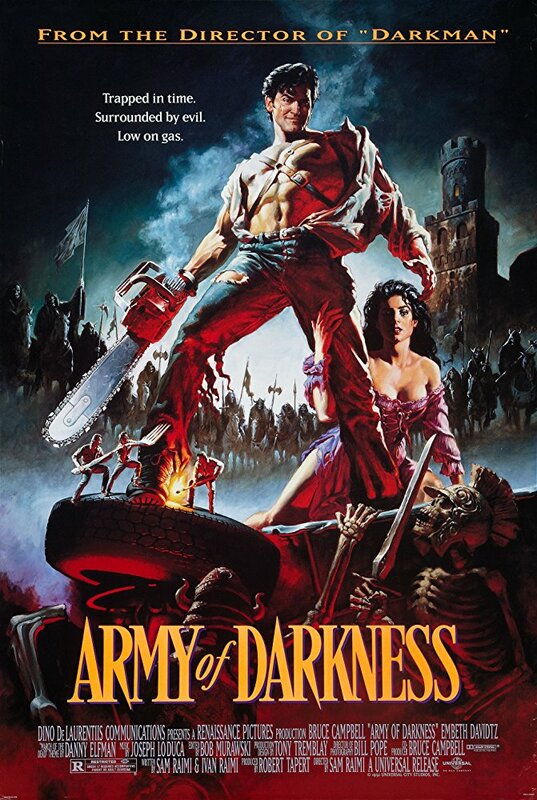 Army Of Darkness continues with the events of the Evil Dead 2's ending Ash(Bruce Campbell), with his chainsaw loaded hand and his '73 Olds flying through time landing, not comfortably at all in Medieval times so to speak. His captors men of the castle.... once again so to speak, take him along with an assortment of men dressed in red lead by Duke Henry, Lord Arthur's adversary. It's not long before Ash is thrown into a pit that contains a couple of creatures that director Raimi likes to call 'Deadites' Ash is thrown his chainsaw by one of the castle's people who believes him to be the one and he quickly rids the world of the evil duo this makes believers of the rest of the villagers and now Ash is living the life of Reilly as he gets ready to do battle with The Army Of Darkness. For those of you that haven't seen this gem of a movie then by all means do so...I now wait for the mush anticipated sequel that apparently Sam is in the midst of working on.